Nitro Funny Cars lived up to their wild reputation with one of the most spectacular races ever seen at Perth Motorplex, though for drivers Anthony Begley and Matt Abel it was for all the wrong reasons. In the first round of the night, Begley had barely stepped on the throttle before a suspected failure in the valve train of his motor caused a backfire that launched the body off the car. Further down track, his opponent Abel had similar problems of his own, with an explosion also tearing apart his Funny Car’s body as it crossed the finish line. Begley explained how he felt the nitro motor lag in the 8000 horsepower Funny Car before it blew. “When I put my foot into the throttle it didn’t seem to go anywhere,” he said. “I couldn’t get my foot off the pedal quick enough and there was a big bang. I remember a big flash of flame and then having no body on the car. Team owner Rod Bailey and his crew made some preliminary investigations into why the engine failure happened at the track, but will take the car home to Queensland to look into it further. Begley said while the moment looked intense, it was a flash flame that disappeared quickly. 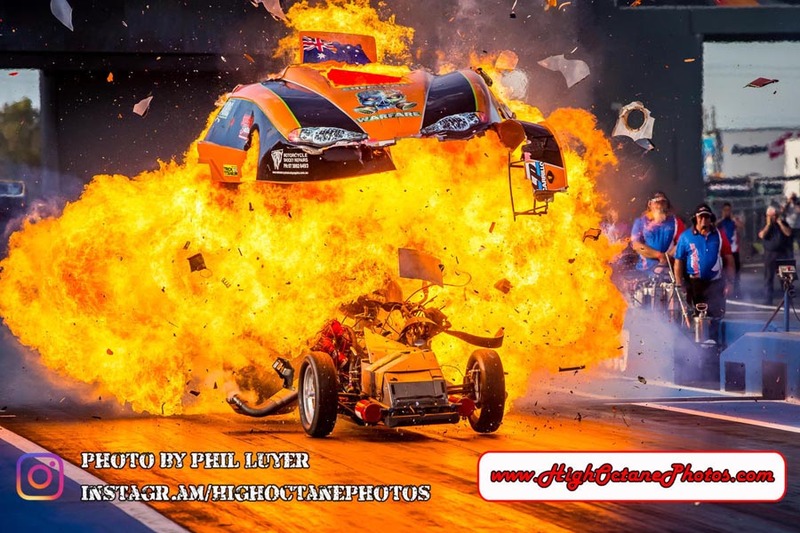 The veteran drag racer said a braking area fire he had onboard at Sydney Dragway in 2013 was the scarier of the two incidents. “Nothing scares you like these things, it will always draw me back to the driver’s seat,” he said. The rest of the event’s nitro racing was somewhat more subdued, highlighted by the arrival of two new nitro drivers. 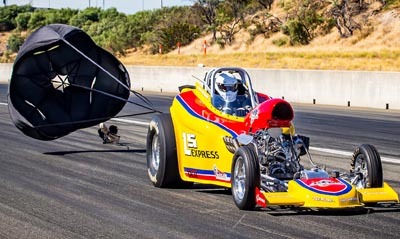 Kyle Putland and Tracey de Jager both begun their licensing, with both adapting quickly to the high horsepower world of nitro. Putland impressed with a quick 5.88sec. on his final run for the night, leaving his team with plenty of confidence. The Northern Territory’s Adam Murrihy defeated local favourite Andrew Katavatis out of the remaining Funny Cars, with a 5.86sec. run in the final driving Rory Taylor’s Nitro Thunder car. In other results, John Zappia claimed the win in the Summer Slam, getting by Daniel Gregorini in the final with a 5.70sec. pass. Errol Quartermaine defeated Nicholas Puglia in Super Comp, while Phill Paton took out Graeme Goldsworthy in Competition Bike. Jodie Mellitt and Alan Mahkoph again went toe to toe in the Supercharged Outlaws final, with Mellitt emerging victorious, while Chris Roe went to his fifth straight final round and won in Top Sportsman against Alby Bakranich. Chris Moore rode to the Modified Bike win against Budgie Jones and Paul Garbellini took advantage of a red light from Graham Smith to take home the Super Street winner’s trophy. 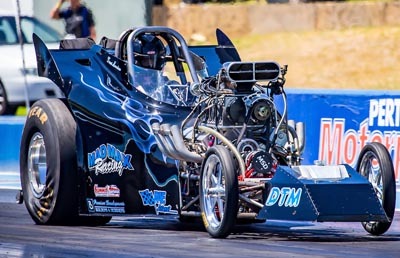 Drag racing returns to Perth Motorplex on February 16 for Round Six of the WA Drag Racing Championships – make sure you are there! Full Results of the event can be found HERE.